Backing up your information is essential to ensure it is safe from computer crashes, breeches, cyber threats, and any disaster where data can be lost. It is wise to create a data retention plan and invest the security of your to mitigate any of the mentioned issues. In the event of data loss and the lack backup, recovery could become costly or unavailable. There are different options for your backup solution depending on your needs, such as cloud vs. hard copy or single vs. multi-tier backup. This article will bring attention to the main differences between single tier backup and multi-tier backup solutions to help you understand which is the best option for your scenario. 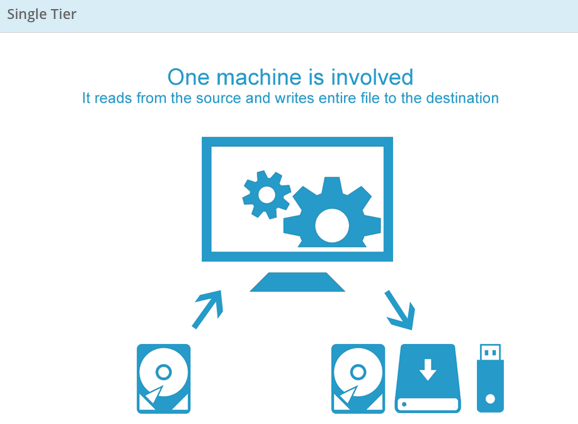 With a single-tier solution, there is only one machine involved in the backup process. This single machine both reads form the source and writes to the destination. This backup option is well suited for environments where the source and destination are close to each other, such as a USB drive. This option typically re-writes the entir e file to destination, even if only a small part of the file is modified. Also, your backed up files are normally not accessible from the Internet without help from a third-party. In general, most single-tier backups are geared towards a single user environment. This backup option is static, meaning; the source and destination must always be connected to each other. For example, your work laptop could only be backed up when you?re in the office, or close to where the destination is. Encrypting data on the target is typically not necessary; being it is geared towards a single user. If you would like to synchronize multiple machines, with single-tier backup, you must do this manually. This backup repository can only be used for backup and cannot be used for something else, like sharing files with the Internet. 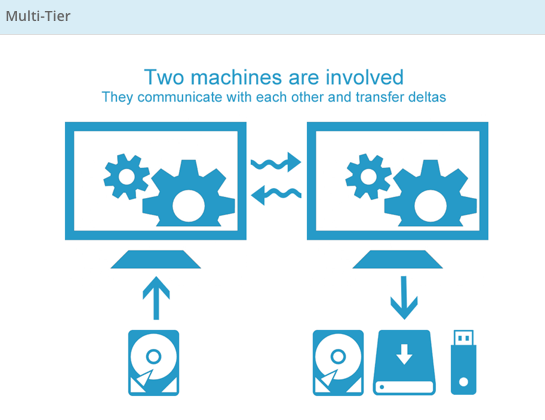 As for multi-tier backup, one machine reads from the source, while another machine writes to the destination. This backup solution is well suited for situations where source and destination are far apart, perhaps across the Internet. Multi-tier backup will only transfer and backup the modified part within a file, which is known as Delta. The backed up files in this option can be accessed from anywhere, simply by using a web browser. With a multi-tier backup solution, several users can backup to a single repository. This option is dynamic, meaning; the source machine can be moved relative to the destination. For example, users can user their laptops on the road and will be able to run backups to the central server from anywhere. In this case, encryption is normally required on the target since data is accessible to other individuals. This backup repository can serve for purposes other than just backup. For example, it could be used to share files amongst colleagues. 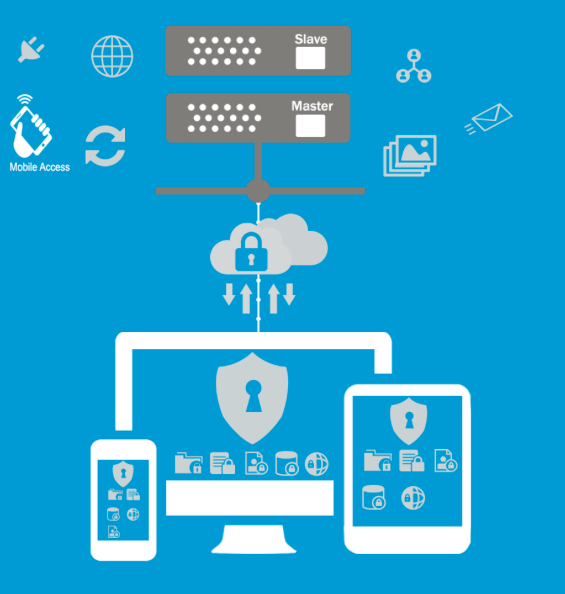 Multi-tier backup also has the ability to synchronize multiple machines automatically. If you're looking for local backup where the source and destination are close by, single-tier backup is the way to go. On the other hand, if you're looking for backup where the source and destination are far apart, multi-tier backup is the better choice. Multi-tier backups are better for environments where there are multiple sources being backed up, and they allow for easy file sharing in business environments. Synametrics Technologies offers Syncrify, a multi-tier backup solution that is sure to meet your needs and exceed your expectations! To learn more about Syncrify and its multi-tier backup capabilities please click here, or contact our support team with any questions or inquiries you may have.